Largely forgotten today, Georges Jean Marie Darrieus was one of France’s great engineers. While he is mostly known in the English-speaking world for his patent on vertical-axis wind turbines (VAWTs), he was a prolific inventor in a number of fields from ballistics to turbo-alternators. When considering Darrieus’ role in wind energy it is useful to remember the time in which he lived. 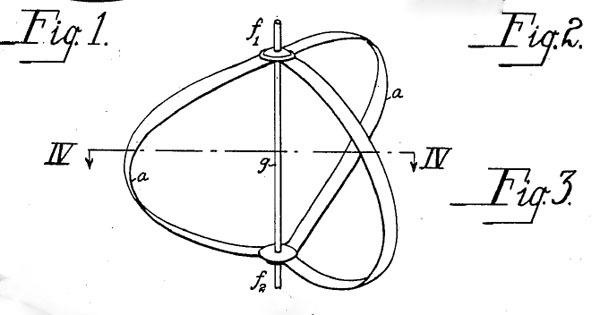 Darrieus filed for a patent on his “turbine having its rotating shaft transverse to the flow of the current” in France in 1925, and a year later in the US. Following the Great War, the field of aeronautics was in full flower and Darrieus was a contemporary of Frederick Lanchester, Ludwig Prandtl, and Albert Betz (of the Betz Limit fame). Darrieus’ patent specifically makes the link to the theories of all three. Thus, Darrieus was well grounded in what was then modern aerodynamic thought. Note: This article is adapted from Chapter 6 on Vertical-Axis and Darrieus Wind Turbines in Wind Energy for the Rest of Us, available wherever books are sold. While the patent illustrates the Φ-configuration VAWT that has come to be most closely associated with his name, it wasn’t the first design he chose to describe. No, he first describes an articulating, straight-blade vertical-axis rotor that we know of as a giromill or cycloturbine. 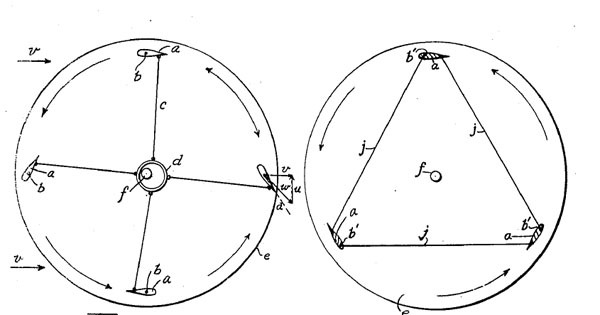 His lengthy patent goes on to describe other forms of H-rotors in what he aptly calls a “squirrel cage” that can be used not only in the wind, but also in rivers and tidal currents. Most telling, however, is that Darrieus installed several experimental wind turbines for his employer, Compagnie Electromécanique (CEM) at Bourget outside Paris. These wind turbines were all what we now call “conventional” wind turbines. Moreover, Darrieus installed these turbines in the late 1920s--after he filed his famous patent on what we now call “Darrieus” wind turbines. That Darrieus had reached the same conclusion as later designers about the need for “fast-running” rotors was evident is his first turbine in 1927. The tip-speed ratio for this four-blade turbine was 6.7—even high by today’s standards. The second turbine ran even faster. French historian Etienne Rogier notes that there is no evidence that Darrieus ever built a “Darrieus” wind turbine. We do know, writes Rogier, that during WWII Darrieus conducted experimental wind tunnel tests on a scale model three-blade, H-configuration rotor. Unlike many latter day VAWT inventors, academics, and engineers who have been lured by the promise of Darrieus turbines, Darrieus himself concluded that the performance of his model was too poor to justify further work. Darrieus was clearly a man ahead of his time, but not necessarily for the invention that bears his name: The vertical-axis wind turbine. The invention of the “eggbeater” and straight-blade, vertical-axis wind turbine were a minor part of his vast body of work over a long lifetime of achievement. Like many other wind turbine designers in the decades since, Darrieus--in the-end--opted for a conventional, horizontal-axis wind turbine. See Darrieus, Georges for a photo of Monsieur Darrieus in 1978. Georges Darrieus' US patent 1,835,018. Georges Darrieus' obituary en francais.